 Rabbit anti Mouse Interleukin-10 antibody recognizes mouse Interleukin-10 (IL-10), an immunosuppressive cytokine originally isolated from T helper type 2 cells (Th2), which is also secreted by B lymphocytes, macrophages, monocytes and keratinocytes. IL-10 inhibits the synthesis of several cytokines including Tumour Necrosis Factor, Interferon-gamma and Interleukin-2 and -3, and has a wide range of biological properties, including inhibition of the macrophage and Th cell-mediated cytokine synthesis suppression of the delayed hypersensitivity response. IL-10 may initially be involved in the polarization of Th2 responses. Antisera to mouse IL-10 were raised by repeated immunisations of rabbits with highly purified antigen. Purified IgG was prepared from whole serum by affinity chromatography. AAM32 may be used in an indirect ELISA with PMP21 as the standard. AAM32 may be used under either reducing or non-reducing Western blotting conditions with PMP21 as the positive control. Ye, Q. et al. (2010) The relationship between collagen scaffold cross-linking agents and neutrophils in the foreign body reaction. Barrat, F.J. et al. (2002) In vitro generation of interleukin 10-producing regulatory CD4(+) T cells is induced by immunosuppressive drugs and inhibited by T helper type 1 (Th1)- and Th2-inducing cytokines. J Exp Med. 195 (5): 603-16.